All Saints’ thrives as a center of spiritual formation, family-centered ministries, early-childhood education, social activism, and community outreach. As a Church in the Episcopal Diocese of Hawaiʻi, All Saints’ is a member of the worldwide Anglican Communion that joins together over 70 million members in 163 countries. The Episcopal Church is rooted in the historic teaching of Jesus Christ and nourished by thoughtful engagement with the Christian Holy Scriptures. The Church is uniquely positioned as a Protestant (reformed) tradition that also draws upon our rich liturgical and spiritual roots of the early Roman and Orthodox Churches. Worship, grounded in the Book of Common Prayer, is at the heart of who we are as a community of faith and seeks to honor the values of tradition, inclusivity, and transformation. Hawai'i has long been known as the "melting pot of the Pacific" bringing together people of different cultures, backgrounds and lifestyles, and so it is with All Saints' Episcopal Church on the beautiful Garden Isle of Kaua'i. Our 'ohana . . . family . . . is a melting pot of not only people, but of faith in every dimension, whether believer or seeker, curious or confirmed, enlightened or downtrodden . . . our doors are open. As Christians, we believe that Jesus Christ is our Lord and Savior, and just as Jesus welcomed all persons from every walk of life, we welcome all to worship and celebrate with us. Our members include generations of families dating back to the very first service held in the church, as well as those who have made Kaua'i their home in more recent times. We are also blessed with an extended family of visitors who return year after year. 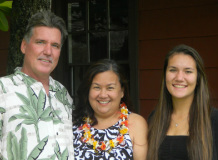 We are their "church home" away from home, and consider them all a part of our 'ohana. To share and live the Good News of Jesus with members and our community, and to serve others. -- a center for worship, education, outreach, and the arts. Uniting everyone through God's love.